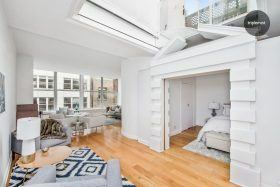 This 2,223-square-foot three-bedroom triplex condominium looks for all the world like a modern townhouse–or, as the listing says, a Tribeca loft or a Hamptons house–in the heart of Chelsea. 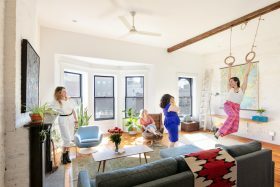 Topped by a rooftop terrace and lit by a 300-square-foot skylight, the three-bedroom home is definitely unique for a condo. Offered by the original owners, this truly one-of-a-kind penthouse atop Williamsburg’s Mill Building has been dubbed the “House on the Roof,” but it could easily be mistaken as a luxurious mountaintop chalet. 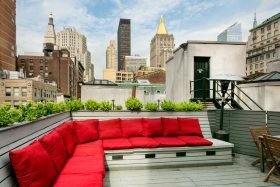 The red-roofed two-bedroom penthouse is wrapped in glass that opens to a massive rooftop terrace complete with a full kitchen setup. And it’s now asking $2.85 million. 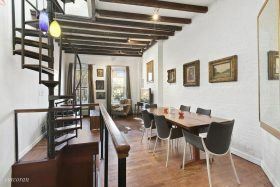 The West Village co-op 92 Horatio Street is featuring a duplex apartment up for rent, and it’s got lots of personality. 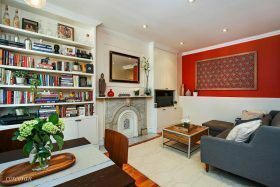 This unit is decked out with dark wood beamed ceilings, two brick fireplaces, and a spiral staircase taking you up to a private roof terrace. The one bedroom also boasts some extra space in the form of a home office. 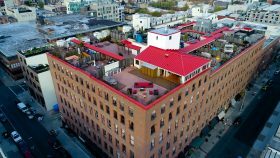 There have been no shortage of quirky co-ops up for sale in this building, but this one is up for rent asking $6,500 a month. This top-floor two-bedroom condominium at 4 Downing Street in Clinton Hill, we’re told, is “an iconic turn of the century building recently completely reimagined and overhauled as a boutique condominium.” Said overhaul was undertaken in 2015 by Barrett Design and Development on what was previously the indeed-iconic Broken Angel House, once among Brooklyn’s most unique landmarks. Artist Arthur Wood purchased the original tenement building in 1979 for $2,000 and subsequently transformed it into a whimsical, livable sculpture, complete with stained glass windows made from bottles and glass, a cathedral-like glass addition, and brick wings. 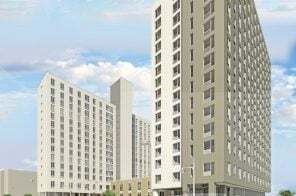 It was also the backdrop for the documentary “Dave Chappelle’s Block Party.” The two-bedroom unit is on the market for $1.55 million; it was purchased as new construction two years ago for $1.42 million. 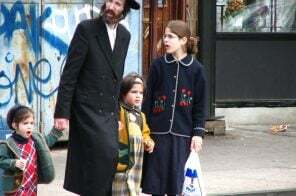 In the middle of a lovely cobblestoned block in the coveted West Village, the five-story Federal-style townhouse at 334 West 12th Street was built in 1853, but its charms hold up against its neighbors in the Greenwich Village Historic District and beyond. 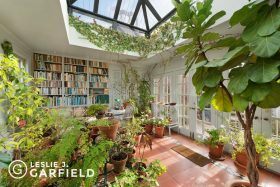 Asking $6.95 million, the 20-foot-wide single-family townhouse has two entrances, five bedrooms, a rear garden that looks like something out of an Italian villa, a large south-facing terrace with views of the Freedom Tower, and its crowning jewel, a skylit solarium brimming with greenery. 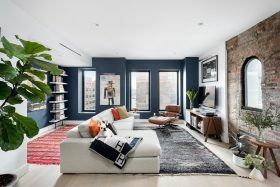 This one-bedroom condo at Soho‘s 118 Wooster Street is offering up plenty of unique features to its next buyer. For one, the 1,250-square-foot interior got a cozy sleeping nook to hold a second bedroom. Then, under 20-foot ceilings, a massive great room, plus a formal bedroom, await. 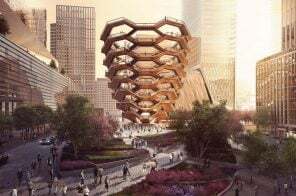 The stairs take you up to a glass atrium, which opens to an 800-square-foot roof deck with a water and electric hookup. For all these indoor and outdoor perks, it’ll cost $2.649 million. 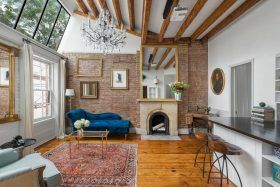 Scale to the top of the historic brick townhouse at 111 East 10th Street in the East Village and you’ll find this charming one-bedroom co-op now on the market for $875,000. The walk-up may not be great, but there are lots of benefits of living on the top floor here. The ceiling has been heightened and expanded to include a row of skylights, and there’s direct access to a private rooftop garden. 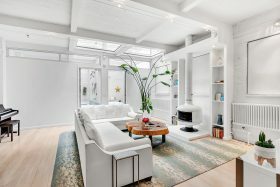 The unit is part of a unique, coveted cooperative comprised of six 19th century townhouses that sit within the landmarked St. Mark’s Historic District, holding 29 residences total. On a picture-perfect block in the heart of historic Fort Greene, this brownstone co-op is both lovely and livable–with two bedrooms and plenty of pre-war charm–for under $1 million. Located at 154 Lafayette Avenue and currently listed at $949,000, this quintessential Brooklyn home is only two flights up from the stoop and has the added bonus of a private rooftop deck.